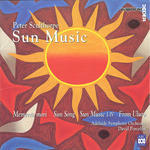 Sun music / Peter Sculthorpe. Instrumentation: Percussion (4 players: vibraphone, 2 marimbas, tam tam, thunder sheet, 2 rain siicks). Book: 2012 Education Program, Meet the Music 3 and 4 resource kit / Sydney Symphony. 16 Mar 2018: at Defying Gravity: Starstruck with Miquel Bernat [SOLD OUT] (Fremantle Arts Centre). Featuring Defying Gravity. 25 Jul 2014: at ASO: Sculthorpe, Dvorák, Bartók (Adelaide Town Hall). Featuring Adelaide Symphony Orchestra, Eugene Tzigane. 19 Jul 14: St Mary's Church, Osterly, UK. Featuring Hounslow Symphony Orchestra. 16 Aug 2012: at Sydney Symphony (Sydney Opera House, Concert Hall). Featuring Alexander Gavrylyuk, Thomas Sanderling, Sydney Symphony. 15 Aug 12: Sydney Opera House, Concert Hall, NSW. Featuring Thomas Sanderling, Alexander Gavrylyuk, Sydney Symphony. 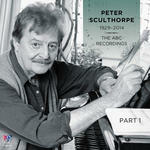 15 Aug 2012: at Sydney Symphony: 3 Russias + Sculthorpe (Sydney Opera House, Concert Hall). Featuring Sydney Symphony, Thomas Sanderling, Alexander Gavrylyuk. 1 Jun 89: SACEM, Paris. Featuring Synergy Percussion.